At one time or another, the circuit breaker has tripped in your home. You know it’s happened because a portion of your home’s lights will go out, or certain outlets will no longer work. When a circuit breaker trips, it is not usually because the breaker itself is faulty—it is doing what it was designed to do: protect your home from a possibly dangerous situation like an electrical fire. When the sensing mechanism in your circuit breaker heats up, it will cause the breaker to trip, stopping the flow of power and effectively rendering that circuit “dead” until it is reset. If your circuit breaker trips only once in a blue moon, there’s probably not much to worry about, but when your circuit breaker starts to trip on a regular basis, it’s time to call in a Flushing electrician to diagnose and fix the problem. Older homes in Genesee County weren’t built with today’s electrical demands in mind. When a circuit is forced to try to draw more of an electrical load than it was designed to carry, like when too many lights and appliances on the same circuit are being used at the same time, the circuit will trip. If this is the case, you can either move some of your regularly used appliances to another circuit, or you can call an electrician to see if it’s time to upgrade your circuit breaker panel. Modern circuit breakers typically have an amperage of 200, while older ones will normally have only 60 amps—not enough for the electrical needs of most homes. The phrase “short circuit” is sometimes used to describe any electrical malfunction. In fact, a short circuit is a very specific condition in which a hot wire touches a neutral wire, which causes a spike in the electrical current flow. A short circuit can occur for a number of reasons. It could be a result of damaged wires, shoddy electrical work done in the past, or a loose connection. If your circuit breaker trips and this is accompanied by a popping sound or a burning smell, you probably have a short circuit and should have your electrical system checked out by a Flushing electrician. A ground fault is similar to a short circuit, except it occurs when a hot wire comes in contact with a ground wire. The result is also similar—your circuit breaker will trip due to the large amount of current that is produced. Ground faults occur most often when you have a faulty GFCI, or when you have hot wires that are not properly seated in their terminals and they come in contact with a ground wire in a grounding device or box. It could also occur if you have water entering your electrical box. What if my Home Still Has a Fuse Box Instead of a Circuit Breaker? 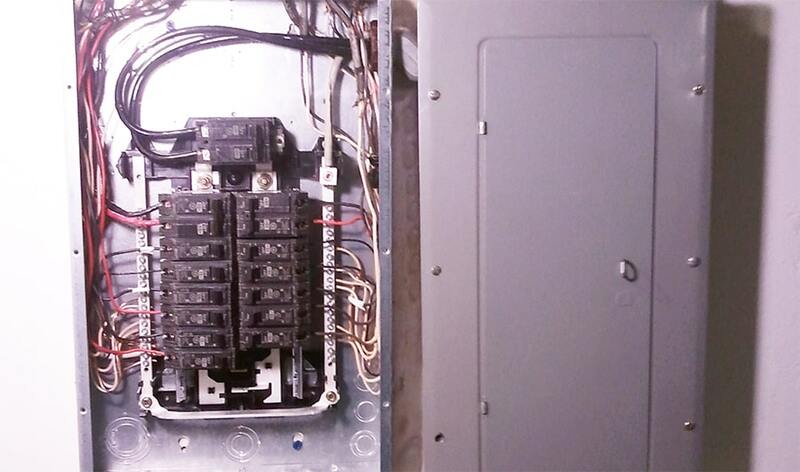 If the circuits in your home are still controlled and protected by a fuse box, it may be time to consider upgrading your fuse box to a circuit breaker. As you probably know if you have a house with a fuse box, every time a fuse blows, you have to replace it. In addition to this annoyance, old fuse boxes are not adequate for the electrical demands of most homes. If you still have a fuse box, more than likely it is overloaded, and it is only a matter of time before you start experiencing problems. You may also be paying more for your homeowners insurance if you still have a fuse box. A circuit breaker that trips or a fuse box that regularly has blown fuses should not be ignored. Contact us at Electrician Express and we can come to your Genesee County home to diagnose and fix the problem right away. "He was really great- very nice man. I would call for him again."